This week I am travelling all around North America with Joe Stirling. As I write up the fascinating and detailed conversations with him as he shared memories of the twenty-one Lions Conventions he visited during the 1970s and 80s, not only as a colleague but also as travel arranger and guide, I feel I am in the great cities – San Francisco, Miami, Las Vegas, Mexico City. 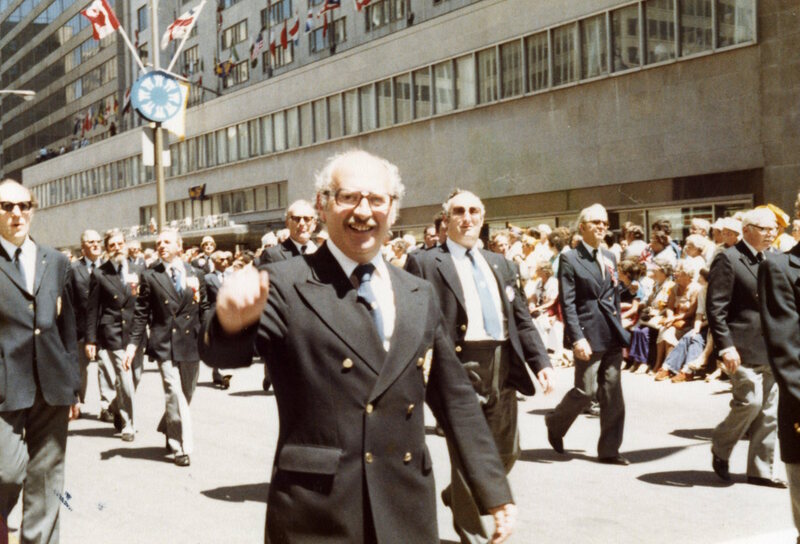 But I only have one photo to share, which will feature in the book, of Joe heading up the British contingent in the Grand Opening Parade in Montreal in the summer of 1979. As for my progress with Escaping Hitler: photos now back from the photoshop, all scanned onto a stick in high resolution, a good friend is preparing a family tree and a map is being designed at the publishers. I am up to over 76,000 words with six weeks to go. THIS WILL HAPPEN. It just needs some application and determination – no problem then!! Joe leads the British delegation!